(left to right) MR. JACOB BEN-MOSHE (Director, Major Residences Co., Ltd.), DR. SURIYA POOLVORALAKS (Managing Director, Major Development PCL. ), MR. PAKORN WORAURAI (Senior Project Manager, Major Development PCL.) and MR. SOMCHAI SIRILERTPANICH (Managing Director, Syntec Construction PCL.) 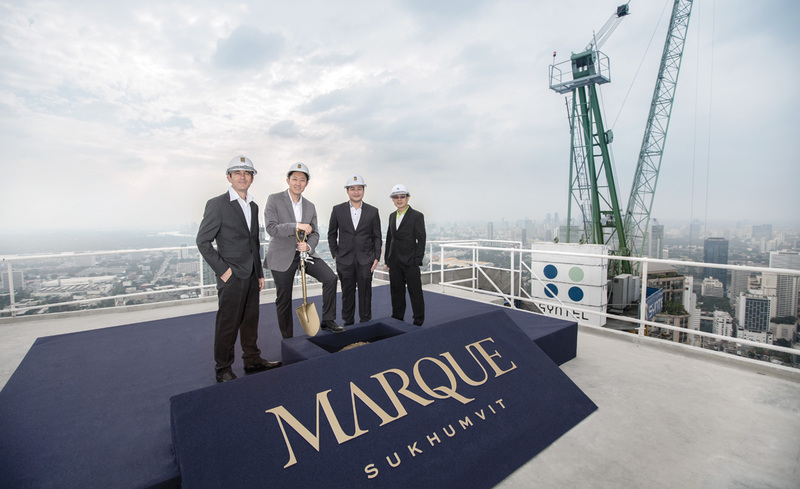 at the peak of the "52nd floor" which represented the highest floor of MARQUE Sukhumvit, 200.10 meters high. This topping ceremony traditionally held by developers to signify the ceremonial last beam (or its equivalent) placed atop a structure during its construction.